Traveling around the globe can be an eye-opening experience, especially when it comes to local traditions. 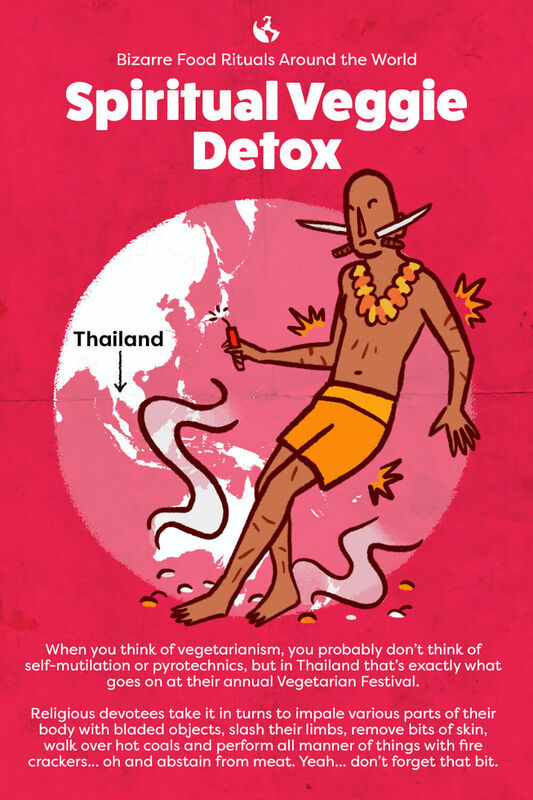 Often, many of these traditions revolve around food and there are certainly a lot of bizarre food rituals out there. The guys over at Amica International have been doing some research and a lot of what they found is definitely not for the faint of heart! So, whether you fancy throwing wine over each other in Spain, or drinking cow’s blood straight from the wound with the Maasai tribespeople in Kenya, there’s no shortage of weird and wonderful things to get your teeth into (literally!). This is a relatively new “tradition” in the grand scheme of things, but an unusual one all the same. 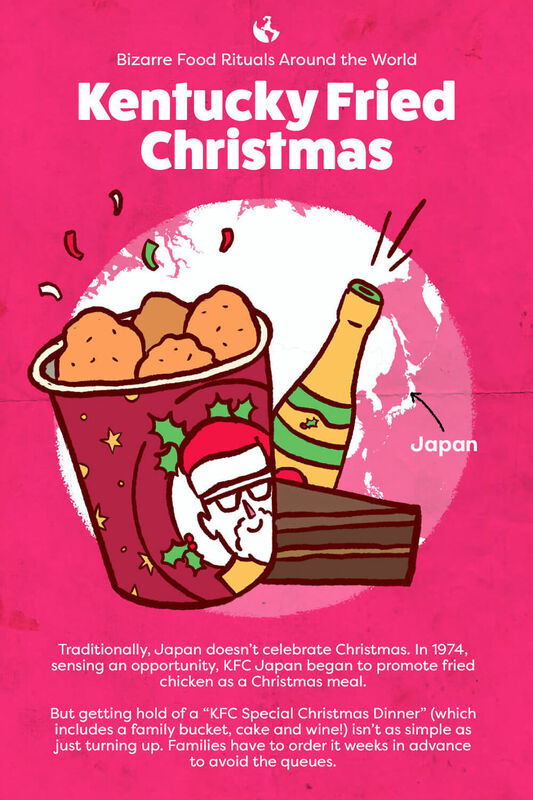 In Japan, Christmas isn’t as revered as it is in the western world, though they do still celebrate it in their own way. Since 1974, KFC Japan has produced the “Special Christmas Dinner” which many families (estimated to be over 3.5 million) treat themselves to on December 25th. The popularity of the festive meal, which includes, chicken, cake, and wine, means that it often requires ordering weeks in advance. Those who don’t order, have to wait in line to get their hands on one, sometimes for hours. 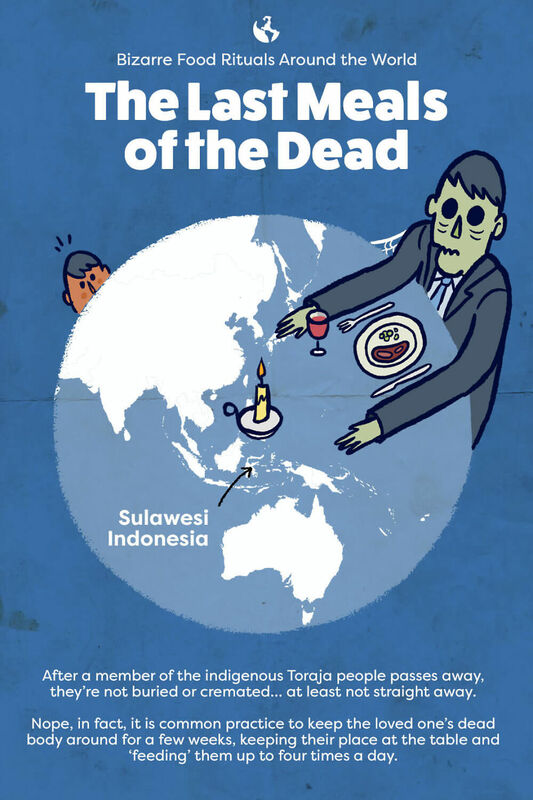 In the Sulawesi region of Indonesia, when a member of the indigenous Toraja people passes away, they’re not buried or cremated… at least not straight away anyway. Nope, in fact, it is customary to keep the loved one’s dead body around for a few weeks, months, or, in some cases, years, before they’re laid to rest. This includes keeping their place at the table. The husband/wife and children will speak to them as well as provide food four times a day—breakfast, lunch, dinner, and mid-afternoon tea. This tradition is thought to have originated in the ninth century and is still practiced today. You might need a strong stomach for this one! Blood drinking is probably one of the more obscure traditions but actually serves a purpose. Historically, drinking the blood of cows helped traveling tribespeople cross the vast deserts of Africa when food and water were in short supply. The warriors of the Maasai tribe still practice this ritual today, either as a delicacy mixed with milk or directly from the veins of the cow. The cow isn’t usually killed, however, exceptions are made at big ceremonies where the animal is passed around. 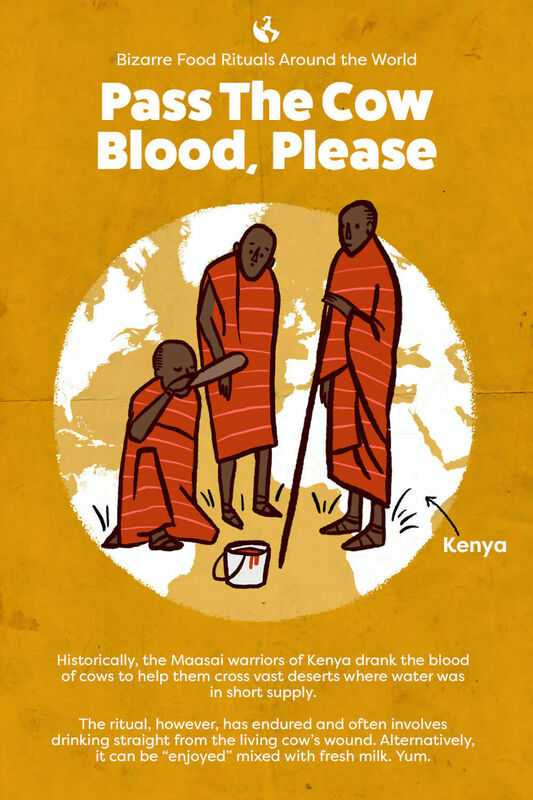 The Maasai people see great value in the blood of cows, and it’s noted that when it’s available, every growing child or pregnant/lactating woman receives a daily ration of raw blood. 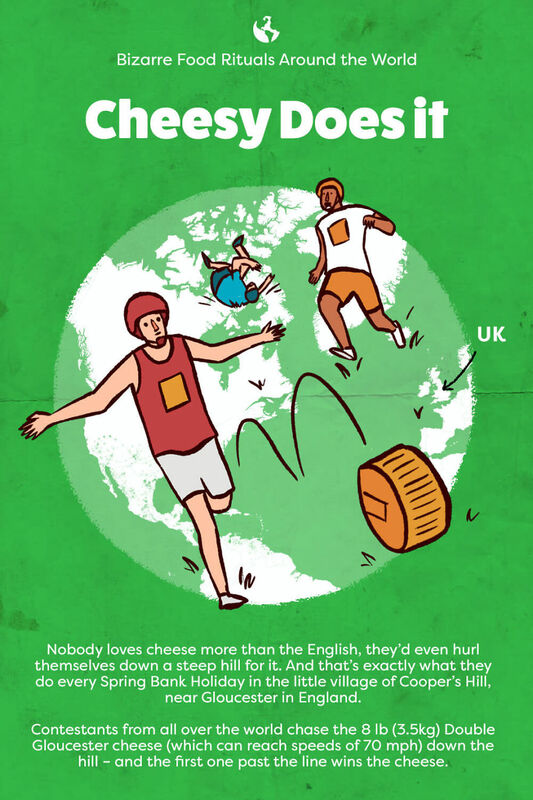 The British love their cheese, and what better way to celebrate this than by hurling an 8lb wheel of the stuff down a steep hill and then chasing/falling after it? The Cooper’s Hill Cheese Roll and Wake was originally created for the locals in the nearby village of Brockworth, Gloucestershire (hence the use of Double Gloucester cheese). However, the hilarity and sheer danger associated with the event has gained international attention over the years, with entrants from all over the world taking part. If you’re the first to reach the bottom, and you’re still in one piece, you get to take home the cheese… and a whole bucket load of pride, obviously. The tradition is thought to have Pagan origins, though this has been disputed. There is one thing for sure though, there’s no denying the love for cheese at this annual event. In the cold, harsh, barren landscape of north-eastern Russia, it’s not surprising to hear that there’s not much to do of an evening. The Koryak people, however, have discovered a novel way to entertain themselves… by the way of hallucinogenic mushrooms. Since ancient times, the Koryak tribe get together and party the night away. After eating the mushrooms, the tribesmen fall asleep for a time and then awaken filled with awe. 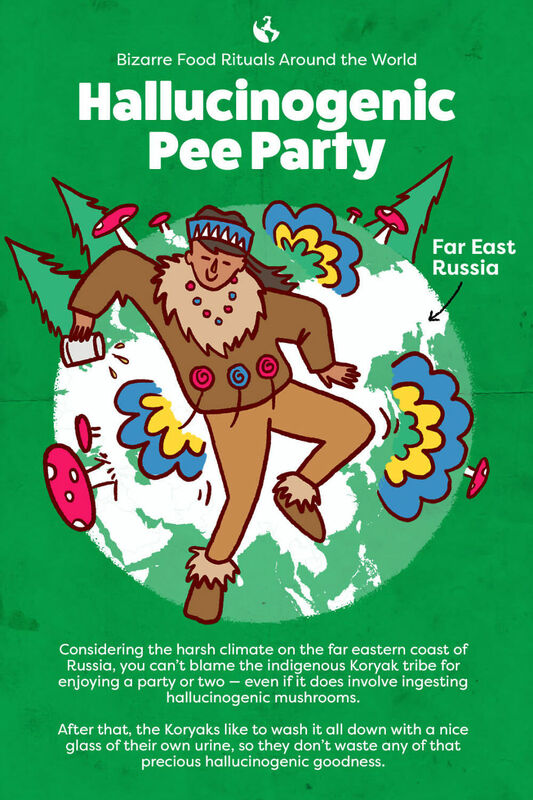 For a number of hours afterward, the Koryak mushroom-celebrants enjoy boundless energy for physical activity, are filled with a sense of hilarity and well-being. Then, when things start to get really wild, they wash the mushrooms down with a nice cup of their own urine to keep the party going. Yep. Don’t be lured into thinking this is a just a lovely little festival filled with vegetarian delights. No, the Nine Emperor Gods Festival is a Taoist celebration that spans nine days, beginning on the eve of the 9th lunar month of the Chinese calendar. While the origins of the festival are religious and vegetarian food plays a big part, the real “fun” begins to unfold on the 9th day when many devotees perform ritualistic mutilations upon themselves and others whilst in a trance-like state. Impaling their cheeks, arms, legs and pretty much any other part of the body with anything from syringes to huge skewers is common practice. Let’s not forget the partial “skinning” either. Oh, and it’s all done without anesthetic too. Great fun. If you love red wine, you’ll love this festival. 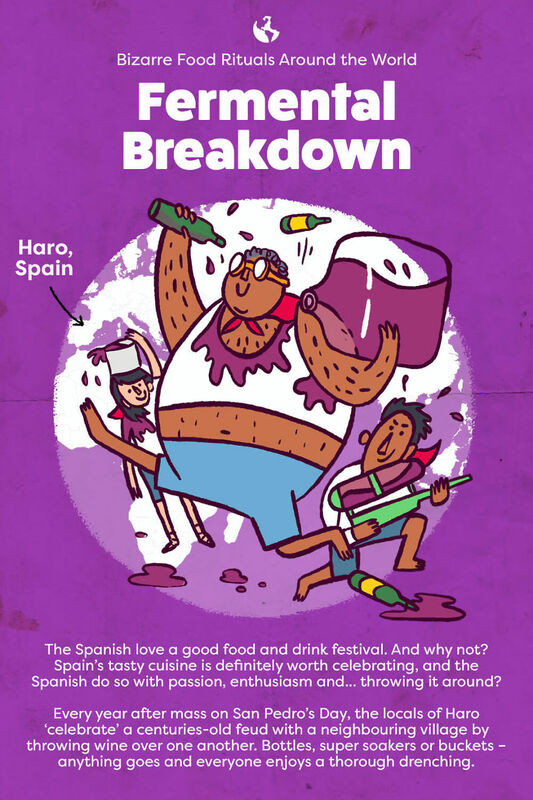 Taking place on the outskirts of the small wine-producing town of Haro, which sits right in the heart of Spain’s La Rioja region, the locals celebrate San Pedro day with a week-long festival of singing, dancing and drinking… but that’s not all. The Wine Fight (or Batalla de Vino as it’s locally known) takes place on the 29th June every year as part of the celebrations. The tradition is rooted in the 13th century when Haro officially marked the property lines between itself and the neighboring town. The lines had to be marked every year to maintain their position, otherwise, the towns would become one. Fast-forward 400 years and this observation broke down, so they began throwing wine at each other. This became known as the “War of Wine”. While the festivities play a huge part in the town’s history, the real attraction is the wine fight, drawing attention from visitors across the globe. Nowadays, there’s one strict rule to adhere to: to take part, you must wear white clothes with a red scarf… you’re free to use whatever means necessary to drench other revelers though!